A blog about books and reading books. That simple! My name's Sophie Priebe and I’m nineteen-years-old. I planned on college, keggers and cute guys—not multiple sclerosis. Yes, my Nana’s had it for decades, but it skipped over my mom. After my diagnosis people treated me differently—so I stopped talking about it and kept it secret. Meanwhile I researched treatments, possible cures—and now I have hope. I traveled thousand of miles to L.A. to find healing: from stem cell studies to alternative medicine like acupuncture and shamanic vision quests. Some treatments could be dangerous: but I’ll try anything because my stakes are high—life and death. I'll risk everything—except for love. I don’t have time for love. But my Nana always told me, “Life, the fates, or God has a funny way of messing with one’s best-laid plans…"
My first night in L.A. I landed in the middle of a campus bar fight and a few beer bottle splinters cut my face. The most beautiful young man I've ever met, Alejandro, took me to the ER, chauffeured me to my new apartment and even washed my beer-drenched hair. He and his friends are Drivers: volunteers who drive students who've partied too hard. My second day I got lost in a dicey part of town and was attacked by gang-bangers. I was lucky—I escaped—this time. While L.A.’s filled with glamour, mansions and celebrities—it’s also infested with folks who would happily take advantage of a new girl. Even if it talk about a quite serious and merciless illness, The Story of You and Me is a sweet story with an intrinsic positivism and lightness. Exactly for this reason, I liked but not loved this book. This is something I felt was missing in Sophie's story. That's said, I really liked the parts focused on Sophie and Alejandro as a couple, even if their relationship is more on the love-at-first-sight side than I'd usually prefer. Alejandro is, after all, the thing I liked the most in this story!!! In the end, I'd like to thank the author for the chance of reading her book for free through Netgalley and I hope she appreciates my honest review of her work. I confess, I'm a little ashamed of myself!!! Well, let's hope that my reader's block truly ended now! 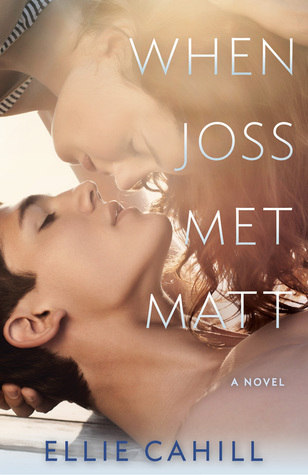 While learning more about Joss & Matt, you can also take the chance to participate at the Rafflecopter down below in order to win 1 of ten copies of "When Joss Met Matt"...what are you waiting for?!?! That said, the Steve in this book is very different from the other Steve and I liked him a lot better!! I also liked how his relationship with Joey evolved, even if it all went a little fast. Too Hot to Handle it's an enjoyable read with some very °hot°, as the title say it, moments between the main characters! While the plot is not exactly original in itself, I liked how the author managed the inevitable drama due to Nikki discovering the silly bet Jake made at her expenses...and that's the reason I awarded Katie Rose's book 4 stars instead of 3. At last I'd like to thank the author for giving me the chance of reading her book for free and I hope she appreciates my review. Share book reviews and ratings with Lara, and even join a book club on Goodreads. Lara has read 0 books toward her goal of 75 books. Lara has read 141 books toward her goal of 150 books.